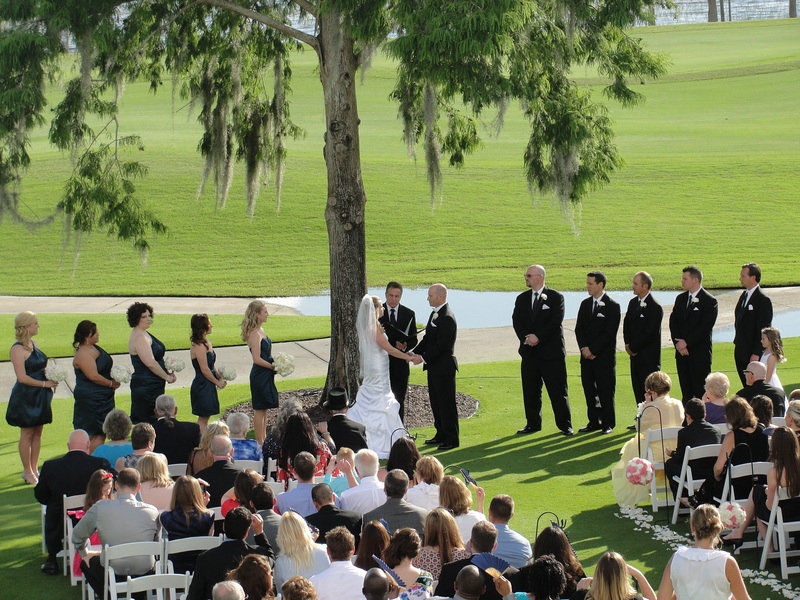 It had rained for the entire week before Matt and Anna were married at the Lake Nona Country Club on May 4, 2013. Even the day of the wedding started off cloudy and rain threatening. The chairs were set on the veranda under cover with the expectation of rain. Then something amazing happened. The sun came out! A blue sky appeared – and stayed. The chairs were moved to the green in front of the clubhouse with that amazing lake setting. The bride and groom got to exchange vows in front of their friends and family in that gorgeous setting. Officiant Lon Tosi read special words that they had written to each other. There were wonderful readings about love, and tears – tears of happiness. Perfect! Everything could have not been more perfect for this amazing wedding ceremony. We wish you much sunshine in your marriage Matt and Anna! Thanks to the wonderful team of wedding professionals for making this wedding one to remember. They are Lake Nona Country Club, Jennifer Adams Photography, and Christy at Anna Christine Events. What a team!